Rationale. Accumulating evidence from neuropsychological and neuroimaging research suggests that facial expressions are processed by at least partially separable neurocognitive systems. 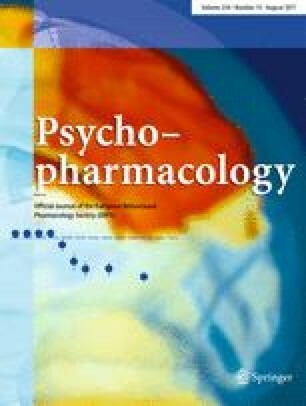 Recent evidence implies that the processing of different facial expressions may also be dissociable pharmacologically by GABAergic and noradrenergic compounds, although no study has directly compared the two types of drugs. Objective. The present study therefore directly compared the effects of a benzodiazepine with those of a β-adrenergic blocker on the ability to recognise emotional expressions. Methods. A double-blind, independent group design was used with 45 volunteers to compare the effects of diazepam (15 mg) and metoprolol (50 mg) with matched placebo. Participants were presented with morphed facial expression stimuli and asked to identify which of the six basic emotions (sadness, happiness, anger, disgust, fear and surprise) were portrayed. Control measures of mood, pulse rate and word recall were also taken. Results. Diazepam selectively impaired participants' ability to recognise expressions of both anger and fear but not other emotional expressions. Errors were mainly mistaking fear for surprise and disgust for anger. Metoprolol did not significantly affect facial expression recognition. Conclusions. These findings are interpreted as providing further support for the suggestion that there are dissociable systems responsible for processing emotional expressions. The results may have implications for understanding why 'paradoxical' aggression is sometimes elicited by benzodiazepines and for extending our psychological understanding of the anxiolytic effects of these drugs.